For Maine legislative candidates, private fundraising is a choice, not a necessity. For more than ten years, the Maine Clean Election Act has provided a full public funding option for qualified state candidates, and the program is the most successful of its type in the United States. Still, some candidates in each electoral cycle choose the "traditional" private funding path. The Leader Board: Maine's Top Legislative Fundraisers and How They Earned Their Spots, looks at the ten candidates who have raised the most private money for their own campaigns between 2002 and 2012. While some have raised a lot of money over many campaigns and others have had just one or two very expensive races, these candidates epitomize fundraising under the private funding option. The Leader Board includes five Democrats and five Republicans. 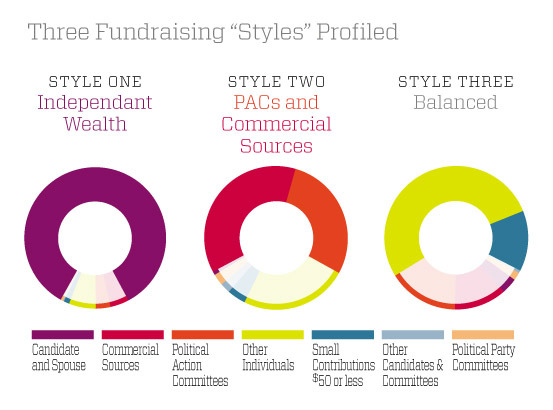 The candidates profiled in this report lead the pack, but their fundraising styles vary. Some candidates self-fund, some raise significant funds from PACs and corporate interests, and some use a balanced approach that includes many individual contributions. These three patterns embody the different interests and values that are typical of the other candidates who forgo public funding. In this study, three candidates with independent sources of wealth primarily paid for their own campaigns. With self-funded candidates, undue influence is not an issue, but fairness and equal opportunity in the electoral process is. Two candidates in the report relied extensively on PACs and commercial sources. Overall, more than two-thirds of their campaign funds came from these types of contributors. This fundraising style presents the greatest threat to public confidence as these privately funded legislators carry out their official duties. The remaining five candidates appear to achieve balance among various sources of funding – small individual contributions, larger individual contributions, PAC funds, commercial sources, political party contributions, and funds from their own bank accounts. Because of the diverse sources and the emphasis on individual donors (67% of total funds raised by this group), these candidates do not appear to favor special interest contributors. All ten of the candidates in this study were bound by Maine's contribution limits, which were lowered in a citizen-initiated referendum in 1996. That ballot initiative, which also contained the Maine Clean Election Act, set the limit at $250 per donor per election, and the 124th Legislature raised it to $350 in 2009. Maine's relatively low contribution limits offer some assurance that privately funded candidates are not subject to the undue influence of a few major donors. At the same time, a candidate's choice to seek out private funds, along with the sources of funding received, are important factors in assessing the qualities of that candidate. The Leader Board contains four candidates who have controlled a PAC in addition to their campaign committee, and donations to PACs are not limited. This PAC fundraising is covered in the first Money in Politics report in this series, PACs Unlimited — How Legislator PACs Distort Maine Politics. Voters deserve to know who funds campaigns. A better understanding about how private money influences public elections leads to a better informed electorate, and that leads to a healthier democracy in Maine.